Perfect gift for quilters, sewers, or hobbyists!!! Perfect project to learn a new skill!!! If you haven’t tried a bias tape maker, this is the perfect project to learn this new skill. Stop the clutter and confusion! Access your rulers quickly, find the correct size with ease, and put them away in a jiff. This clever hanger will store all your basic rulers, plus a rotary cutter. 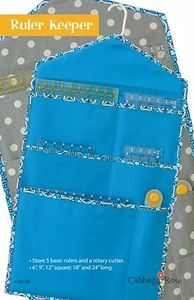 The handy pockets fit a 12”, 9”, and 6” square; plus a 24” and 18” long. With sturdy cotton duck canvas, you can even tuck a Dresden or triangle in there too. What a perfect gift for quilters, sewers, or hobbyists; and if you haven’t tried a bias tape maker, this is the perfect project to learn a new skill.